Today, I had my gallery hopping day. I joined a wonderful group and we were in 2 cars: Bob and Sandy Kinzie, Barbara Brown, Robin Hopper, Lee Middleman, Bob Nichlos, Edith Franklin and Rick Andersen. We saw the most interesting shows at the Lewis & Clark College, the Clackamas Community College, where Robin Hopper and his wife Judi Dyelle exhibited some beautiful pieces, the Skutt Ceramics factory kiln site with a very wonderful “Teapot” exhibition. 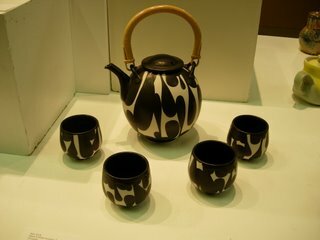 This is a beautiful Black and White teaset, made by Sam Scott in Seattle, WA: www.samscottpottery.com . 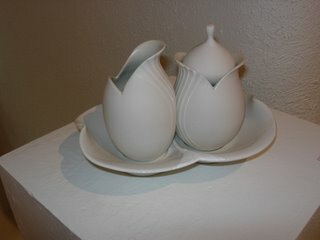 Also, we visited the Hall Gallery and the Center Space Gallery, where Mel Jacobson had his wonderful show. There were still lots of other shows, but you have to make a choice and perhaps I will still have some time to see more in the coming days. Around 4pm it was pouring rain and very cold and windy and then we were ready to return to the hotel. Unfortunately, we didn’t go to the Japanese gardens, because of the weather. Robin thinks it is one of the most beautiful Japanese gardens in America. He himself landscaped a Japanese garden on his property near Victoria, BC, Canada. So, I will try to go on Saturday. Tonight, we had the opening ceremonies and the keynote speaker: dr. David Suzuki. He is an avid environmentalist and scientist and gave a depressing, but revealing and eye opening speech about what we are doing to the earth. Especially, us, clay people, who work with the earth. Tomorrow, I will go to panel discussions, demonstrations, lectures and video screenings and exhibitors hall of manufacturers. All, have a good night.